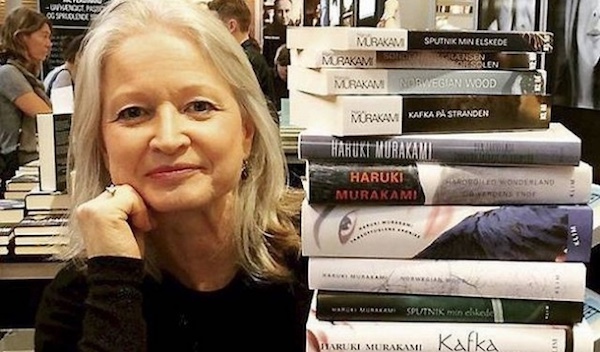 Mette Holm has translated many of Haruki Murakami’s books into Danish. Like millions of people around the world, I enjoy the work of Japanese author Haruki Murakami. So I had to watch the documentary Dreaming Murakami, which is actually about his Danish translator Mette Holm, and the difficulties of translating from another culture and another writing system. Should a certain Japanese word in a passage about the impossibility of perfection be translated as “sentence,” “text” or “work,” as in an entire novel? That’s just one of many questions to be answered. Murakami’s stories deal with memories, sensations, the world of the imagination. Sometimes there are parallel time lines, or multiple worlds, and nameless narrators. What a challenge! Holm reminds us that a person must know at least 1,850 kanji characters to read a Japanese newspaper, and then admits that she does not have a good memory for them. Ouch! We see Mette Holm in Denmark, working at home with her cat (Murakami likes cats, too) talking to other translators on the phone and in person, and at meetings at her publishing house. She makes a half-hearted effort to be diplomatic when she does not like a proposed book cover. She warns that Murakami probably won’t like it either. The publisher looks crushed. Mette Holm with some of her translations. We also see Holm in Japan, leaving Ueno station (it figures in some of Murakami’s stories), taking cabs, talking to people in bars, possibly in the same one that Murakami used to own, or one much like it. The view of the city from her hotel room window made me think of my visit to Seoul, South Korea. Intriguingly, Holm came to her work as Murakami’s translator by a rather roundabout route, via French and France. The film ends just before a sold-out conversation between Holm and Murakami at the National Library of Denmark in November, 2016. It’s an artistic decision I have mixed feelings about. It might have been nice to at least see them shake hands, embrace, whatever they did upon meeting. Another artistic decision that didn’t make the film better, in my eyes, was a large CGI frog that follows Holm around Tokyo. He is the title character from Super-Frog Saves Tokyo, a short story by Murakami that was published in 2002. The frog in the film is tall, but not bulky, and his voice is low, slow, and muffled. Frog wants help in fighting “Worm” but if you haven’t read the story you won’t know that if Worm is not stopped soon he will cause an earthquake that will devastate Tokyo. You can read Super-Frog Saves Tokyo on the GQ web site. Despite his serious mission, the character of Frog has some amusing aspects, to my mind. In the short story, not in the film. Because I am a big fan, maybe I was expecting too much from Dreaming Murakami. It’s interesting enough, though there’s nothing earth-shattering in it. On the other hand, I’m not sorry that I saw it and I don’t want my 57 minutes back either. Dreaming Murakami is being shown at RIDM, Montreal’s documentary film festival, along with two other shorts. Teta, Opi & Me, directed by Tara Hakim, is the love story of her Austrian grandmother and Arab grandfather. It’s 25 minutes long. 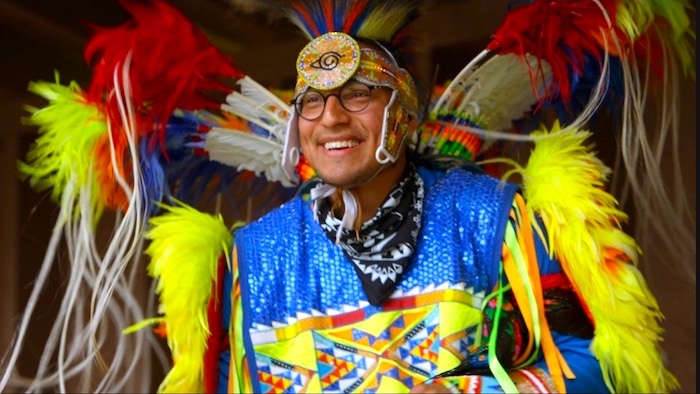 Turning Tables, directed by Chrisann Hessing, is about Joshua DePerry, a music producer, DJ and dancer from the Anishinaabe community in Thunder Bay. It’s 16 minutes long. Friday, Nov. 16, 2018, 8:15 p.m.
Visit the RIDM web site for more information about the festival. Joshua DePerry in his dance costume, from the documentary film Turning Tables. I enjoyed Turning Tables immensely even though I don’t like techno. At just 16 minutes long, it left me wanting to know more about DePerry’s life and future achievements. Turning Tables ends with DePerry about to go to Berlin. Hessing said that he did indeed go there, and that he’s there right now, already on his second visit to that city. She did film him going to the airport, but in the end she decided not to use that footage. She didn’t go to Berlin with him, either, because she felt that might intruding on his first-time experience there. That collaboration includes a music video and the Turning Tables Tour which will take them the film and DePerry’s DJ equipment to a series of reservations. Joshua DePerry shows his DJ equipment in the documentary film Turning Tables. That quote about the Turning Tables Tour comes from the film’s excellent web site, which is bursting with information and high-quality photos. Bravo for that! Turning Tables is being shown at RIDM, Montreal’s documentary film festival, along with two other shorts. Teta, Opi & Me, by Tara Hakim, is the love story of her Austrian grandmother and Arab grandfather. Dreaming Murakami, directed by Nitesh Anjaan, is about Mette Holm, the Danish translator of the Japanese novelist Haruki Murakami. It’s 57 minutes long. Tawfiq Abu Aitah (Opi), left, and Gerlinde Abu Aitah (Teta) are the grandparents of filmmaker Tara Hakim. The short documentary Teta, Opi & Me celebrates love, resilience and craziness – the good craziness, that’s warm, positive and spontaneous – not that OTHER kind of craziness that we see so often these days. Tawfiq noticed Gerlinde right away. (“I saw you dancing like a crazy one!”) He wanted to dance with this wild and crazy woman. Luckily for him, she wanted to dance with him, too. Despite the many obstacles thrown their way, it seems that they have rarely been apart since then. Teta’s mother and grandmother liked Opi; Teta’s father was kept in the dark as long as possible. He was a man who had framed his daughter’s 1942 birth certificate, the one that attested to her “pure blood.” When he found out he freaked out and did his best to keep the couple apart. Opi’s father did the same at first, though his big family eventually welcomed Teta with handholding and kisses. Teta’s father did not attend their wedding. 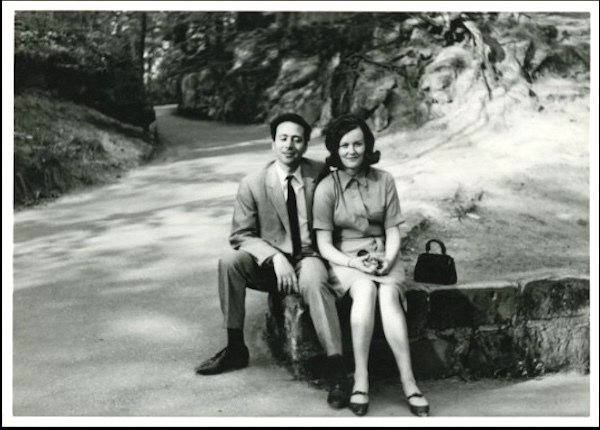 Love, life and war took Teta and Opi from Austria to Germany, to Bethlehem and then to Amman. Their story is told through family photographs and anecdotes, mostly related by Teta (“My grandmother loves to tell stories!”) when Tara visits them at their home in Amman. Tara Hakim took part in a Q&A after the screening, so we were able to learn more about her grandparents and how she shot the film. She spent one month visiting them in Jordan. At first she tried to film with a fancy camera, lights and a boom mike, but it put too much of a distance between them; it was too unnatural. She had been shooting them on an iPhone, in person and via Skype for years and they were used to that. So she went back to that method. Sometimes they didn’t even realize that she was filming. It was only during the Q&A that we found out that Teta’s father accepted the relationship at some point. Language lesson: Opi often calls Teta crazy, in an affectionate way. At the beginning of the film, Tara Hakim tells us that the Arabic word for crazy is majnūn ( مَجْنون ). The Arabic word for bougainvillea sounds very similar and the couple’s garden is full of them. The flowers appear often in the film. Gerlinde Abu Aitah (Teta) in a shower of bougainvillea flowers. Teta, Opi & Me is being shown at RIDM, Montreal’s documentary film festival, along with two other shorts. 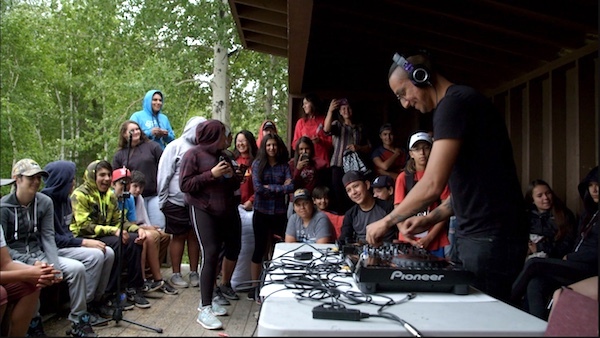 Turning Tables, directed by Chrisann Hessing, is about Joshua DePerry, a music producer, DJ and dancer from the Anishinaabe community in Thunder Bay. It’s 16 minutes long. Dreaming Murakami, directed by Nitesh Anjaan, is about Mette Holm, the Danish translator of the Japanese novelist Haruki Murakami. It’s 57 minutes long. Tour de France fans enjoy themselves while wait for cyclists to appear in the documentary film Holy Tour (La Grande Messe). 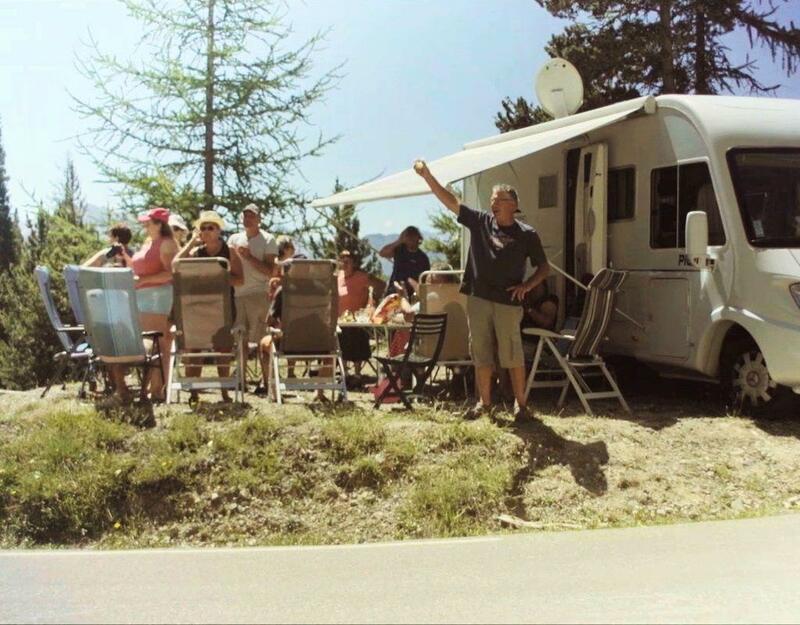 The documentary film Holy Tour (La Grande Messe) is a gentle and amusing visit with some Tour de France fans who are waiting for the cyclists in the 2017 edition of the race to flash by. They set up a roadside camp almost two weeks before at Col d’Izoard (Izoard Pass) in the French Alps, where the scenery is the scenery is stunning. The fans are a relaxed, friendly, funny bunch and they pass the days before the Tour arrives with walks, sunbathing, playing cards, reading, chatting, cuddling small dogs, and eating. One man cycles uphill to a scenic restaurant to have a birthday meal. We laugh with them, not at them, as they wonder if it is too early for an aperitif, and struggle to pick up a TV signal, so they can follow the race as it heads their way. Certainly, there are worse ways a person could spend a vacation. When Holy Tour is over, you might feel light-hearted and relaxed, as if you, too, had just enjoyed some fresh air and camaraderie. Holy Tour (La Grande Messe) is part of the Festival du nouveau cinéma, which continues until Sunday, Oct.14, 2018. In the Iranian film Pig (Khook) a blacklisted director cannot make films, but he CAN make really weird commercials for insecticide. Pig (Khook) is so funny that it might be a big surprise for people who expect Iranian films to be serious, sad, or downright tragic. Added bonus: Leila Hatami, who has been in many sad and serious films gets to have some fun in it, too! Pig is written and directed by Mani Haghighi. It’s about blacklisted filmmaker Hasan Kasmai (Hassan Majuni), who has not been allowed to make films for the past two years. Luckily for him, his family and for us, he IS allowed to make TV commercials. 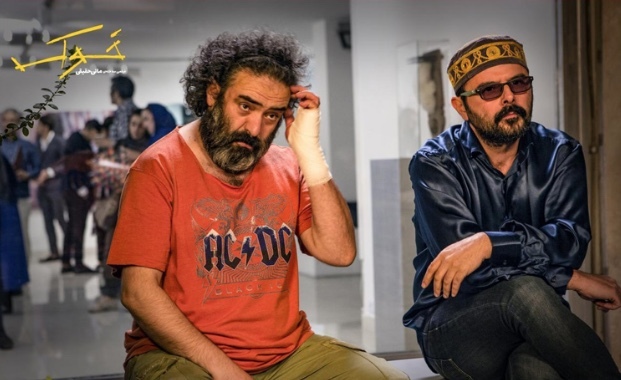 Hasan Majuni, left, plays director Hasan Kasmai, while Ali Mosaffa plays his hated rival, Sohrab Saidi, in the Iranian comedy Pig (Khook). Hasan was already upset that he could not make films, but now he has new worries. His muse and mistress Shiva Mohajer (Leila Hatami), who became a star through his films, is considering a part in a film by one of his rivals, the highly pretentious and unlikable Sohrab Saidi (Ali Mosaffa). Leila Hatami plays Shiva Mohajer, muse to director Hasan Kasmai. Hasan is jealous when she considers a role with rival director Sohrab Saidi. Things get more complicated when a video of Hasan throwing a public tantrum “goes viral.” Threats uttered in the heat of the moment against two of the murder victims make him suspect No. 1 and he’s arrested by Azemat (Ali Bagheri) the sinister, high-level, pony-tailed policeman who’s been following him around. I enjoyed Pig immensely, though I thought a few script decisions went too far. Within the first few minutes I was wondering “Censorship? What censorship?” Amazingly enough the script was approved by the Iranian authorities, despite the dancing, the mistress and many other things. You can see Pig on Tuesday, Oct 9, 2018, at 9:30 p.m. at Cinémathèque Québécoise (355 de Maisonneuve E.) as part of the Festival du nouveau cinéma. Donnie Yen plays teacher Henry Chen Xia in the film Big Brother. Dedicated teacher tries to get rebellious high-school students to smarten up and take school seriously. 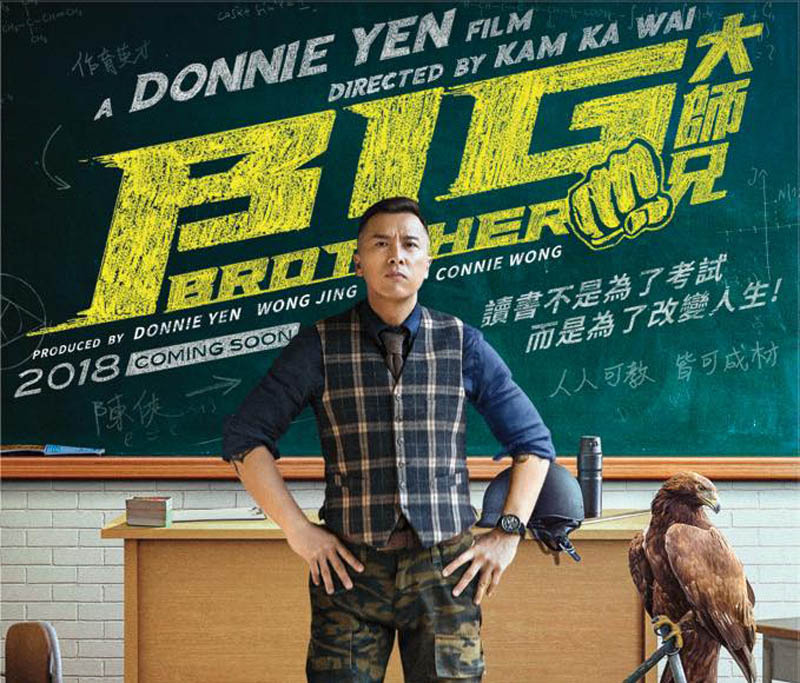 This is a familiar plot, but the teacher in Big Brother is played by martial-arts superstar Donnie Yen, so that’s a big plus. Even though Yen’s character, first-time teacher Henry Chen Xia, is smart, funny and caring, we know he won’t be accepted right away, he has to win the students over. Watching him do it is part of the fun. Each student has at least one problem on the home front that has contributed to their seeming indifference to school; Chen tries his best to solve all those problems. The future of the entire school is in Chen’s hands, since the Hong Kong education department will close it if the dismal pass rate doesn’t improve. On top of that, gangsters are waiting to pounce on the school site so they can build luxury condos on it. But, but. . .what about the fights? It wouldn’t be a Donnie Yen film without them, but by Yen’s own choice, Big Brother is more about education than anything. It isn’t wall-to-wall fighting that’s barely held together with a paper-thin plot. 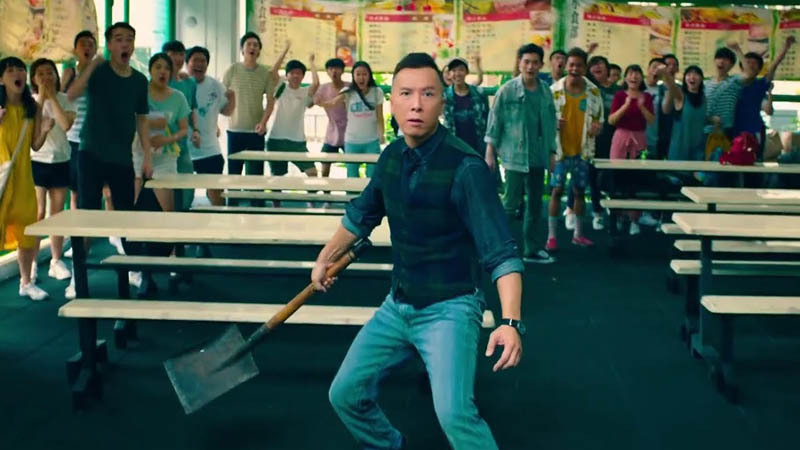 Donnie Yen as Henry Chen Xia, ready to defend his school. Chen’s search for a missing student leads him to a locker room just before a (crooked) mixed-martial arts tournament. This gives Yen a chance to mix it up with burly, scary looking guys played by Kang Yu, Lockhart Ogilvie, Jess Liaudin, Brahim Achabbakhe, Tom Caserto, and Semiquaver Iafeta. “Look, guys, I’m not looking for any trouble,” he tells them in English. Ha, ha! Fans know what to expect next! Conveniently enough, Kang Yu’s character is also involved in the development scheme, so he and assorted minions will battle Chen again in the schoolyard and inside the school, shattering glass, throwing desks and breaking many things while they’re at it. A long-ago fight, with Lin Quinan playing the young Henry Chen, is quite impressive, too. This young man has star potential! In fact, he was in a 2016 film called Long quan xiao zi (Kungfu Boys). in Donnie Yen’s film Big Brother, Lin Quinan (left) plays Henry Chen Xia in his student days. Kang Yu (right) plays the main villain. From my description, the film might seem terribly corny but it did not feel that way while I was watching it. There are some “I see what you did there!” moments, and I was fine with them, too. I appreciated that Yen’s character is not just a fighting machine, he’s a caring human being. Teacher Chen has had his share of problems, and seen many horrific things, but he survived to tell the tale. He doesn’t want his students to give up on themselves while they’re still in their teens. And if life is unfair, why not fight to make it better? Just as important, he doesn’t want the education authorities to give up on the “difficult” students, either. Does closing an underperforming school really solve anything? Why not work to improve them? Donnie Yen put his money and his star power behind this film, which is obviously dear to his heart. If Big Brother encourages some students to stay in school and leads school administrators to rethink their methods, Yen will have accomplished a lot. And more power to him! I’ll include other details about Big Brother in a post about Kam Ka-Wai, the film’s director. Kam participated in a Q&A session after the film and granted me an interview as well. 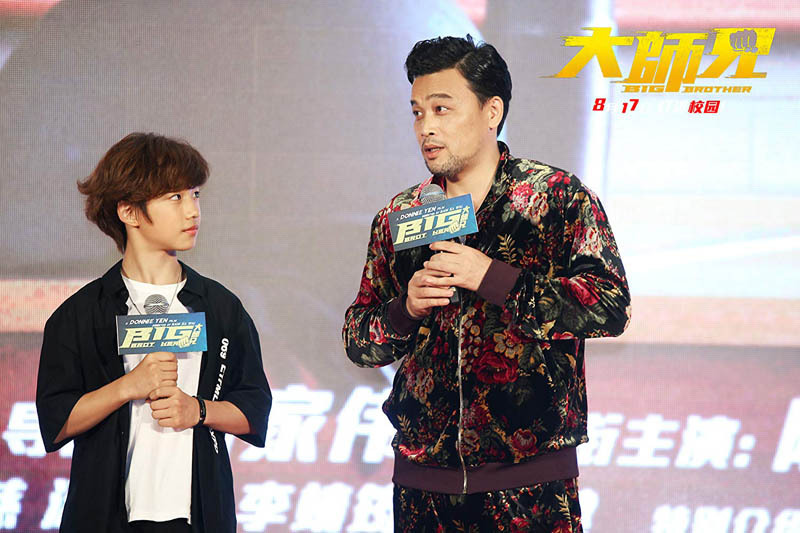 Big Brother will open In Hong Kong, Malaysia and Singapore on August 16, 2018, and in China and Taiwan on August 24. No word about a North American or European release yet, so maybe Donnie Yen fans should get going on social media and ask for it.